Luton’s 28-game unbeaten League One run came to an end as Charlton scored three second half goals on Saturday. Lyle Taylor scored twice (once from the spot), either side of Igor Vetokele’s strike and that was enough to overturn Harry Cornick’s 15th minute opener. See how Town’s players rated on the day. James Shea: 4.5 - The goalkeeper was fortunate only to see yellow in the first half when he rushed off his line and took out Igor Vetokele, just outside his area. The striker already having shot wide before the contact is likely what spared him, but he conceded three goals for only the second time this season. The last time being Town’s previous defeat, six months previous at Barnsley. Jack Stacey: 5 - The game was set up for his counter-attacking talents in the first half but there was none of that in the second and he was involved in a tangle with Jonny Williams that Charlton claimed should have been a penalty before giving the ball away that led to Charlton’s third goal. James Justin: 5 - The full-back was left frequently isolated in the first period and Charlton sought to exploit that at every opportunity. He was prevented from showing his attacking talents in the second half by the Addicks’ effective pressing and got the wrong side of Lyle Taylor when the striker hit the bar and scored the home side’s third. Matty Pearson: 4.5 - The usually rock-solid centre back had a torrid time against Lyle Taylor and Igor Vetokele. He slipped over frequently and at crucial times, most notably when Taylor hit the bar in the first half. He then got caught out of position for the Addicks’ second and third, by sloppy play in Luton’s half. Sonny Bradley: 5 - The captain was adjudged to have fouled Lyle Taylor for Charlton’s penalty equaliser, but replays showed he barely touched the forward. He was left isolated for Vetokele’s goal. Pelly-Ruddock Mpanzu (STAR MAN): 7 - He drove Town forward in the first half, supplying the assist for Harry Cornick to open the scoring early on but, like the rest of Town’s midfield got overran in the second period. Andrew Shinnie: 4.5 - One of his quietest games of the campaign and the frustration told late on with a second bookable offence, earning him a first red card in Town colours and meaning he’ll miss the trip to Accrington on Saturday. Luke Berry: 6 - Involved in some attractive play in the first half but his best attributes were stifled after half time, so he was subbed off in the 81st minute. Elliot Lee: 5.5 - Looked in decent nick for periods in the first half, having been moved further forward into the striking role vacated by the suspended James Collins. He started the move for the opening goal, but was ineffectual after the interval and was subbed off in the 81st minute. George Moncur: 6.5 - Would have scored a stunner but for the acrobatic reaction of Charlton keeper Dillon Phillips to palm away his top corner bound curler. He was instrumental in most of Town’s promising forward play before half time, but he ran out of steam after half time and gave the ball away, which led to Charlton’s second. 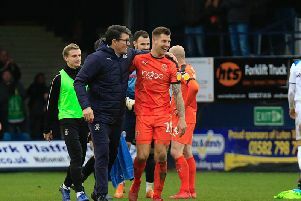 Harry Cornick: 6.5 - Made his first start since December 29 and scored a cracker, a sublime side-footed strike into the top corner on 15 minutes, with Luton’s first chance on Charlton’s goal. But he was subbed off on 68 minutes with a lack of match action taking its toll. Aaron Connolly (SUB): 4 - Brought on for Cornick for his Hatters debut but it will be one to forget, particularly as he found that two of his limited amount of touches were to kick-off after Charlton had scored. Jason Cummings (SUB): 4 - The forward couldn’t provide the heroics of seven days earlier, with Luton failing to make any impression of Charlton’s goal in the second half. Alan Sheehan (SUB): 4 - The damage was done by the time the club captain was introduced and he picked up a caution in stoppage time.